Kathy Duva of Main Events isn't one to be pushed around. The CEO of Main Events has long asserted that promoter Yvon Michel of Group Yvon Michel (GYM) had agreed to pit Adonis Stevenson against her fighter, Sergey Kovalev, in a light heavyweight bout that would be televised on HBO. The WBC champion, Stevenson instead signed a deal with advisor Al Haymon and opted to fight Andrezj Fonfara on May 24 on Showtime with a possibility of meeting IBF-WBA champion Bernard Hopkins in a unification bout later this year. On Wednesday, Duva filed a federal lawsuit against Michel, GYM, Haymon, Stevenson, Golden Boy Promotions and Showtime alleging breach of contract, breach of fiduciary duty, fraud, tortious interference and interference with prospective economic advantage. But the suit could lay bare some of boxing's dirty secrets and could, if it goes to trial, rock the sport to its core. The arguments Duva makes in her complaint against Haymon are among the most serious, interesting and impactful. Haymon is an advisor and manager for many fighters, but is extremely media and camera shy. He does not speak with the media, never appears in public functions and operates almost completely behind-the-scenes. Haymon is a licensed manager in Nevada and has been since 2002, but many in the sport allege he is a promoter. Duva's suit directly makes that allegation, which would be a violation of the federal Muhammad Ali Act if proven. The federal law prevents managers from serving as promoters and vice versa. Attorney Patrick English of Main Events wrote in the complaint, "Defendant Al Haymon holds himself out to be a manager or advisor to professional boxers. In point of fact, as we will explain later in this complaint, he actually operates in the role of promoter." 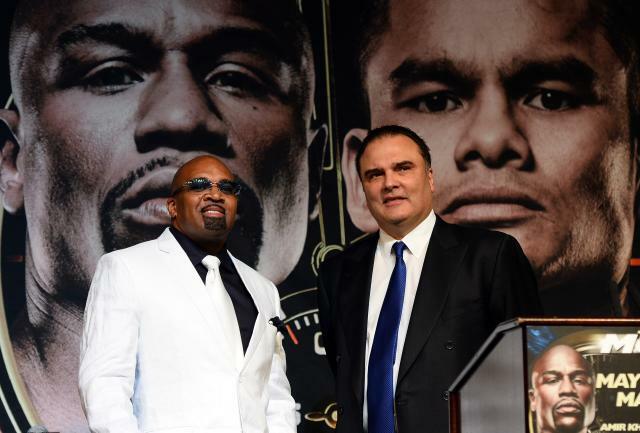 The complaint alleges that Haymon and Golden Boy CEO Richard Schaefer have "entered into an alliance," the purpose of which "is to wrest control of Golden Boy from Oscar De La Hoya for their own financial gain." It also exposes a seamy side of boxing. The complaint points out that Leon Margules is the attorney for GYM, Stevenson's promoter while also serving as the co-promoter of Fonfara, Stevenson's May 24 opponent. That would appear to be a conflict of interest, because if Margules is to do his best on behalf of GYM as its attorney, it could be at the detriment of Fonfara, whom he co-promotes. If a dispute were to arise between Fonfara and GYM, Fonfara would be in the position of having his co-promoter be the attorney for the other side. Through a spokesman who cited company policy, Showtime's Espinoza declined comment, as did Schaefer. Haymon, who does not speak with the media, could be reached.